Jan was still wet, from the flood a while ago, the biggest I had ever experienced in the place. Damaged to crops was incalculable, only that many padi fields were just about finishing replanting (cedung), time were not that wasted. The normally funful water festival during flood had nearly anti-climaxed into an unusual course of nature. 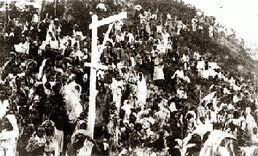 The old folks were talking about comparison to the "Bah Air Merah" (The Red Water Flood) which by events synchronisation pointed to occur in 1930's. We never regreted though; it had been a common acknowledgement that the more the flood demaged the more goodies it brought afterwards: more fish in the padi field, bigger fish in the river, and more importantly no need to fertilize the padi for the next few years; and what more: it was rumoured that a croc was spotted in Buluh Gading padi field, it was ushered into the nearest marsh which joined the river Nerus on high tide. I did not see it myself, it was a talk of the coffee-shop. I was usually very much looking forward to go back to the hostel, especially after such a rather long (third term) break, I missed the hostel life: the bright electric light, clean WC, clear water, 'coursed' meal, tea or coffee and with milk too, non-muddy walkways, and especially friends whom I sensed had a high regards on me, and more especially this year was our first major exam in the secondary school: the Sijil Rendah Pelajaran - SRP (the English version was LCE - Lower Certificate of Education); in the older days it was called Standard Seven Exam, and the SPM, Standard Nine Exam. I returned to the hostel on Sat morning 8 Jan (a week delay because of the flood); the 'frolicks' would begin of course the next day Sunday when the new school day begin. In the hostel, we were staying in the room as we were last year. The hostel captain was Husin, naturally a form fiver. My room head was Alias, like last year, assisted by Mamat Ibrahim. At one time Alias had my hair cut, it was so bad, it embarassed me, and finally Sulong Mohamad, a quiet, serious senior came to rescue so that it did not look too bad. I was in Form 3A, as many of form 2A class members last year; a few had to go and replaced by another few, based on the final exam in oct last year, in my case, with the results no one could match. Our form teacher was CheGu Ahmad Yahya Tohar. He was an Art teacher. I have to admit that then I was a teen-ager, if you get what I mean, and thus went for a mind over-haul so that all memoirs as well as Bahasa Kebangsaan, Bahasa Melayu, Bahasa Inggeris, Almu Alam, Tawarikh, Ilmu Hisab I, Ilmu Hisab II, and Sains lessons of the Sijil Rendah Pelajaran (SRP) subjects would be able to share the same virtual abodes in my brain. There was a pack of ten of us in Class 3A. They were Ismail Mohamad (A), Jalil Ghani, Mohd Embong, Abdullah Yusof, Abdullah Embong (A), Omar Taib, Othman Ngah, Shafie Mohamad, Mariam Jusoh, and myself. This pack took Ilmu Hisab II in their SRP, while the rest of the class took Lukisan (Art). With the option, I did not have to mess myself with the water colour since during the Lukisan period we would go into other room to learn Ilmu Hisab II, but sometimes our brain got messy with colourful equations instead of our shirt. We were supposedly the brainy pack since we dared to take the Ilmu Hisab II, the kind of math not even for ordinary teachers, and therefore we were strongly bonded to each other. On the first day CheGu Ahmad Yahya came to the class, he asked who would want to take Hisab II (instead of Lukisan) in this coming SRP, to please raise their hands. Every one in the class raised a hand. Then he spoke for twenty minutes about what SRP was about. After the talk he asked the question again. Only the ten left their hands raised. The talk had put down the rest's raised hands. The question was not raised in other form three classes (five other classes), even some teachers did not encourage students to take Hisab II in their SRP. Only the 'stuborns' like the ten-pax were allowed. Thus I never had lessons from CheGu Ahmad Yahya although he was my class teacher. During Art period, the ten-pax would go to another class to be taught Hisab II by CheGu Nik Rashid, who also taught everyone Hisab I. CheGu Ahmad Yahya also appointed the class monitor by election in his first day in the class. And as for the past two years, Mariam was voted; perhaps my friends felt that I could contribute something for the class, so they voted me the assistant. 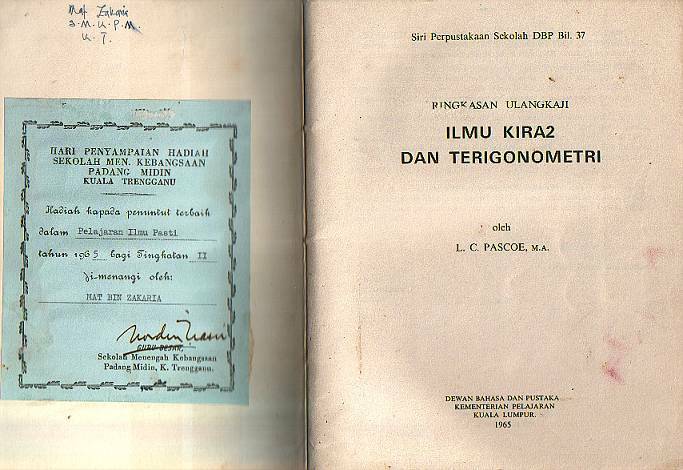 The book that distinguish the ten of us from the rest of the form three - The Log Book, which was used extensively and exclusively for Math II. Science had not yet reach that needed level. Abdullah Embong (A), Abdullah Yusof, Mohamad Embong, Othman Ngah, and myself had another covalency that bonded us together stronger: we were the recipient of Biasiswa Kechil Persekutuan since 1964, with a few others, the life-line that kept our 'schooling clock' ticking. We were supposed to be the brainiest, but unfortunately the most havenots. It was true about the latter, I had been to their homes, and they had been to my home. Abdullah E and his family lived practically in a hut on a small padi plot, rather remote from a place called Kg Aur, Chendering, on the plot of which his father grew anything that could be eaten by the family members, and sometimes went to the sea. Abdullah Y stayed in Surau Panjang, fatherless, whose family depended on his mother's sales of cookies in market in KT. Mohd Embong stayed in Kuala Ibai, in front of SSSS, whose father was a sea-fisherman in a single seater rowing boat, and Othman stayed with his mother who stayed with her father in Paloh. Othman's father stayed in Duyung probably with his new wife. Many years later, I also visited Omar's place in Batu Hampar, whose father was much older than my father, and also Jalil's place in Kijing, Marang. I had not been to Shafie's place in Kemaman, or Ismail's place in Pulau Ketam, and never paid much attention to Mariam, except that my mother once used to say that there was a girl from Dungun studying here who was actually my relative. My mother's description matched Mariam although I never talk about this directly to her. Nevertheless, I found out in the class that there were many more brainies, and many more even more havenots than ourselves. Jalil, Ismail, Shafie and myself stayed in the hostel, while others ride bicycles, or by bus every day to the school. As the days went on, I came to know more about my class-mates, more than that when I was in form 2 and form 1, and reciprocally, they came to know more about myself. I felt particularly dear to Othman Ali from Surau Panjang, a kampung mate of Abdullah Yusof, for his humorous character. He was a kind that could fish out any buried sorrow in a friend, a one with a heart as opened as an ocean, his mechanics of smile would unchain all one's shy and silence, a cool as cool as afternoon swim in a stream, and his laugh numbed all one's anger. He came to school by bicycle, and always at my side in the morning assembly before entering the class. Zaharah read "Shair Si Tanggang" with a high pitch melody in our literature class; it got me an itchy cough in trying to immitate. Zawiah was a cute and pretty girl and visibly a close friend of Mariam. Both of them could have made up a part in an alternative different destiny, if it were blessed in my life because each had a respective receptive 'reason d etre'. Ali Yatim from Padang Air was seated next to my bed in the hostel. He petronised me so much in my prep-study that he tagged beside me all the time in the hostel prep class, through to mid-night, and even very early in the morning; I never have to ask his company to study at odd hours, he was like my shadow; he would wake up when I wake up, and he would walk when I walk. I used to buy Shafie a meal or two in the school canteen during recess on the day I received my shcolarship; he looked like a late-learner and he made it looked like Abdullah Che Din of Form 3B was his guardian (both were from Kemaman, but Shafie had an elder brother staying not far from the school). Halimah, a tall and slender was a towner; Kamariah Ali and Kamariah Hassan were from Duyong. Only later of the year I knew that Kalthum was from Wakaf Beruas. Ramlan was another towner. Othman Ngah was very good in English, I learned a lot from him, and English was the only subject I was led by others. Syed Mustafa was probably not a fully local because he spoke with a 'foreign-corrupted' accent. Mohamad Awang and Ismail Mohamad A were sportmen, both were sprinter and relay team members. They were the only sportmen in the class, the rest, especially me, were "kaki bangku", although a few like Ali Yatim play football for a fun. An image permanently carved in my memory in Chendering in 1966. A green Morris Minor like the one Utz Manan drove to school. 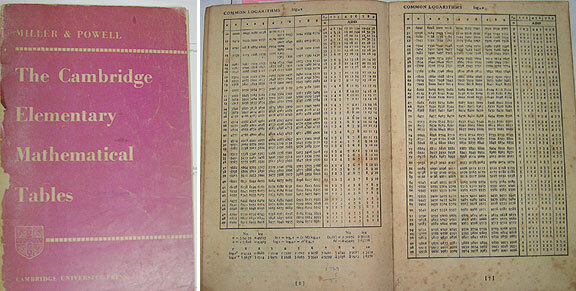 CheGu Saadiah continued to teach us Bahasa Melayu, as did CheGu Ghazali Haron continued to teach us science. During the first term break he gave us a homework to finish at home. It was about 'false fruits', we had to find out examples of false fruits and sketch them in the note book. I was so useless at home alone during the break, I cycled to Othman's house, then to Abdullah E's house in Chendering to complete the homework (alas, they were apple, pear, chiku, cashew, and many more), stopping at Abdullah Y's house in Surau Panjang. It was on this occasion that I noted Abdullah E's family, I met his brother, and his father and hope that he would still remember me, like Mohamad Embong's mother, and Othman's mother, whom I met at their places a few times. CheGu Mustafa Jar taught us Ilmu Alam (geog). During second term break he organised extra classes in the school for our SRP. I came to the class on the bicycle from home, and he was very particular for late arrivers. I had seen he was very furious with them. One day it came to my turn; I was very late because I had to borrow the bicycle from relatives. When I arrived, the lesson had run for about one hour. I was in wet shirt, wet by the sweat, cycling in a great speed trying to reach in time. Seeing me at the class door, wet in sweat, CheGu Mustafa only said "come in" and the lesson went on. Ustaz Abdul Manan (coming to school in a green Morris Minor) taught every class Islamic Studies. Mr Subramaniam taught us English (in the mid year exam, of all the mistakes I made was to spell "exident" for the "accident"). 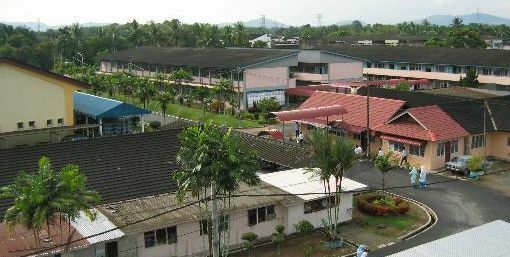 The school HB was Zakaria Sulong. Most of the prefects stayed in the hostel. I remembered some of them: Wan Muda Mamat (hockey goal keeper), Shaari (a handsome boy from Dungun), Sulong Mohamad (serious looking boy from Mak Kemah, Bukit Payong), Md Nor (bulky footballer, when he sprinted it looked like he was running backwards), Wahab (the x-country ace), Husin (the hostel captain, slightly a stammer; a footballer who dislocated a knee-cap in a match). Ajil Ismail (from Ajil, a sturdy and inpenetrable fullback of the football team) was rather naughty; the HM CheGu Nordin solved it by appointing him a prefect and after that he behaved better than the behaved boys; he played football no one would dare to tackle the ball he was dribbling. I am not quite sure about the girls, since all prefects were fifth formers, I was rather junior then. But Rohaini Mustaffa and Suraya Ismail were catch-names at the time. Those day, there was annual occasion called "Speech Day", the occasion to award the academic excellence. This is one of the prize I won for the best I did, in mathematics, when I was in Form 2 last year. I received it from the DYMM Acting Sultan of Terengganu, Tengku Mahmud (the Sultan, Sultan Ismail was the Agong). Other prizes I recieved was the novels "Magdalena" and "Patah Sayap Terbang Jua", for the overall. I was the class, even in a sense, the batch valedictorian. I believed it was due to my staying in the hostel. Had CheGu Hussein failed to stop me to quit the hostel early last year, I would not had been so. In April it was speechday. The Acting Sultan of Terengganu, Tengku Mahmud was the guest of honour, and I received my prizes from him, in Math, Science, Geografi, and History, plus the overall, from the results of last year final exams. I was told by a teacher that the school had to put a cap on me to allow others to receive too. The day was accompanied by an exhibition, and I helped CheGu Maimunah, the geography teacher to put up a stall showing the traditional padi processing method. It took me unexpedted skill to build (with Ali Yatim) the wooden device for I had not seen one myself [pukul padi - a device not yet used in my place; it was used in other states like Kedah for short term padi; for long term padi, this device does not work]. I made it purely from seeing the picture in the textbook. Abdullah Embong 'B' my classmate, borrowing my only trouser, posting with his closest junior, Baharuddin. Some of my buddys in the hostel who were really looked up at me, L-R; Standing: Kadir (F5), Omar (F3), Anon, Abdullah Embong (F3), Anon, Mohamad Sulaiman; Sitting: all juniors. In July there was another co-curriculum activities organised by the school. My form teacher, CheGu Ahmad Yahya took our class for a stage drama, on a traditional script. I was one of the 'actor' selected, not the hero part, but rather one of the villain, actually a family of villain. My 'wife' was Halimah, and I was the eldest (the younger was Jalil with his 'wife' Kamariah Ali) in the family to 'topple down' the 'sultanate' (Ismail). I went once for a "speaking contest", did not know who organised it. CheGu Halim picked me up (recommended by Wan muda Mamat - a form fiver, supposedly Malay Language Society), first a hit at Grammer School, then a final in the Hall of Sultan Zainal Abidin Secondary School, Batu Buruk. I was given the title "Tempat Jatuh Lagi Dikenang, Inikan Pula Tempat Bermain", and CheGu Halim fed me with what to say. I was bad compared to the arabic-trained speakers; nonetheless, everyone was given something to take to back the school, in my case a consolation prize, a novel "Di Bawah Lindungan Kaabah" by Hamka. During the second term break in July - August, I had another little sister. She was Akmam, and she came in the time we were in the deepest misery. During her pregnancy my mother did every thing she could to prepare for her long "lay-off", she was waiting for whatever would happen to us. In the meantime, AyahLi was solicited by a childless distant relative, TokTeh who lived in Teluk Pasu. Feeling obligated to my father he talked about it; obviously my father gave full liberty to my mother to say the single word. I was crying very loud in silence for somebody to take care of my little sister while I was going away. I went back to the hostel when the word had yet to be said. I was told only when I returned home for weekend break that Akmam was in her home then. My mother narrated to me all that had happened. She was loved more than we were. The SRP exam was in October. I was more than ready for it, with my index number 6-LF/LF 1060. A month before the exam, form three classes were given 'study leave', but in the class. CheGu Ahmad Yahya asked us to form 4-6 members groups and carry on with group discussion on respective subject during their periods in the class. To my embarrassment, I was made a member in the group comprising Zawiah, Mariam, Zaharah, Halimah, and Kamariah Ali. I was completely surrounded by girls during those final periods in the class before we sat for the important exam. In the hostel I was even befriended by form fivers to help them solving some of their elementary math problems. The exam was in two weeks, after that we were practically stopped studying. We had an ample time after the exam, before the term ended in the middle of November, and it was really a frolick time since many of the teachers were themselves drowned in the STP exam they themselves were sitting, after invigilating the SPM exam. 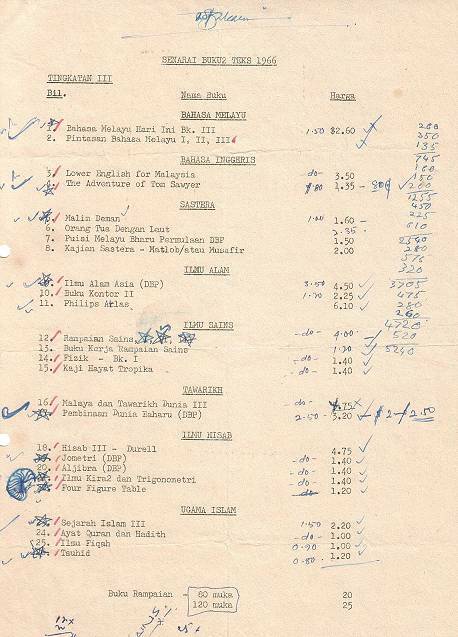 Among them were CheGu Ahmad Yahya, CheGu Hussein Ahmad, CheGu Razali Haron, CheGu Rahmat Saripan, CheGu Rahim Tahir, CheGu Nik Rashid, CheGu Mustafa Jar and many more. We were left on our own. The Headmaster, CheGu Nordin Nasir's headache was not that we were harming the school by not being attended, but by not being attended it was a waste of our learning inquiries for we were actually a good bunch of pupils that he never had any problems with our discipline. By then many of our friends, especially those of form three C and below had already 'on leave' to cut cost, and some of them, to help the family. So, CheGu Nordin asked us to organise activities, collected to be presented in one day what he called Form Three Day; like last year two weeks before the term end. Obviously it culminated as a stage show comprising, as always in those days, a four to five episodes drama, two or three comedy actions, a few songs (without accompanying band), and a tableau. So, we were set into practicing to fill up the day. With no teachers around to guide, I was persuaded by friends to find a drama script, which I found one in my brain, a modern one, while others tried another ideas. We found a few girls who were willing to sing, one was Nafisah from 3B. During the presentation day, I gave my speech representing all form three pupils, then the headmaster's speech officiating the day. There was no band at all accompanying, the best music came from a portable tape recorder which we borrowed from CheGu Rehana. The singer sang, in a melody I reckoned slightly better than the sound I made in the bathroom, at one point CheGu Sulaiman took his pity accompanying some girls with his box guitar. And the drama that I wrote and directed was rotten with the absence of literature value, filled with the silence of bad vocal that at one episode CheGu Ahmad Yahya came to the back of the stage asking us to shout in order to be heard. Nonetheless, it was our day, and we had our day, similar to the day enjoyed by the form three pupils last year, hoping it would be a similar day for the form three pupils next year. Some friends in anticipation, sufficiently updated to let me have their 'shadow', (L-R): Zawiah, Khamsah, Abdullah, and Syed Mustaffa; "we shall meet again". My friends had to wait another two years to have my 'shadow' like this. The same street in 2006 jun; the clock had been removed; the background had been added with building, but the 'surau' in the middle of the picture is in peace with an added front section; the market stalls on the left had been renovated; the shops on the right is there in the original piece. Jalan Jail (2005), in 1960's, opposite of Cathay Cinema, infront of Badminton Hall next to Mergastua HQ (Wildlife Dept) next to Merdeka Agency along the Bus Station - Masjid Putih road. The rows of shops, small shops, light coffee shops for the cinema patrons, and the passers by. Whenever I cycled down to town and met friends, many many times with Othman Ngah I insisted to come here for a cup of ABK (air batu kacang), it was only 10 cents per cupful. Monsoon came rather early this year. It was a non-stop raining during the final week, right after the Form Three Day, and it was raining to the last day of the school term. A few pupil left for home early from the hostel, but I waited to the last day I was allowed in the hostel, till Friday, with a few friends, mostly the seniors. The flood had come and it was very close to the school; on Thursday evening, the final school day, we rushed to HM's quarter (the HM, CheGu Nordin was not at home) to make ourselves available to help his wife (who was pregnant) when a sudden torrential rain made it look like the quarter was 'sinking'. Luckily it was just the car that had to be removed to the higher ground beside the road outside the school compound. It was Friday and I had to go for then no more food available to eat. Many roads were already closed to traffic, including the main road KT to Kuala Brang in front of the school. So I moved out in the late morning, with a couple of friends left, and with my belongings, as usual, a sling bag containing my clothes and a carrying bag containing my books, all together small and light enough for me to carry. Ismail Mohamad was with me, but Sulong Mohamad (a form fiver) was going the opposite way. From the hostel in a drizzling rain we hiked towards KT to Pengadang Baru where I saw nothing but a continuous field of water up to the distant Wakaf Beruas, with the road, running on the padi fields entirely invisible. It happened that there was a Landrover belonging to Forestry Dept leaving to KT after delivering relief supply at Pengadang Baru. The driver, a retiring-age man did not mind us going with him to KT in his Landrover, and the village people around us gave their blessing for the driver to take us, a bunch of innocent flood-stranded school kids, to KT across the flood water in the Landrover on the sunken road with the bordering padi fields were invisible. It would be about six kilometers journey. So off we went slowly, while the caring villagers kept watching as we pushed through the water, for about two hundreds meters, the driver began to feel the Landrover was swaying, actually coasting the road side, then ditched into the invisible padi field. Seeing we were ditching, the villagers ran and rushed to our rescue, while we were jumping out of the vehicle. No one was hurt, and they helped pulling the vehicle back on the road. We moved on, but this time Ismail sat on the Landrover's bonnet guiding the driver, a bit to the left, or a bit to the right, assuring all the time that the white road divider line, barely visible, was always in the middle of the vehicle; no other vehicles was passing. We reached KT bus station, but no bus was going anywhere because all trunk roads were closed somewhere. I was practically stranded in KT, cannot go home and no where to go. 2007 Oct 5 Fri Update. At Pengadang Baru junction, viewing towards Wakaf Mempelam. In 1966, it was just a two single carriage way. On both side of the road was just padi fields. And in Nov 1966, the fields and the road were sunken. Today, all the fields had been topped and became dwelling places. Ramnant of the fields were seen only far away from the road. 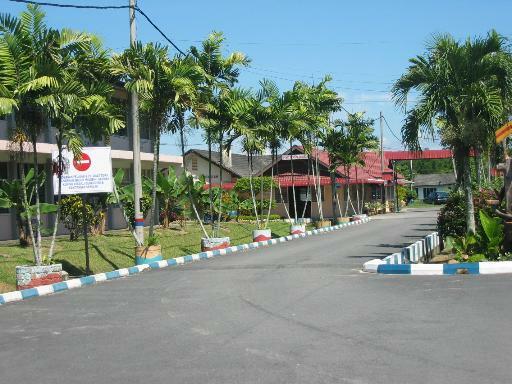 A pic of SMKPM I found on the net. The road straight from the main gate. Turning right was to the front of the hall then the school office and the class blocks. The right side in the pic is the hall left side (on entering the hall). The left class block was not quite ready yet in 1966. Appeared from this picture, the Head Master quarter (centre pic) had had some extensions and had been changed, perhaps to an academic elemental unit, it has a shed joining to the then canteen which was behind the hall. Straight on the the background was the sports field; it appeared now to have filled with concrete structures of dwelling nature. Viewed from the opposite side, slightly aerial off left. The hall is on top-left; the then canteen is on the left foreground (without the extension - the brighter roof part, and was no wall; a number of pupils are walking in front of the "Head Master's Quarter". This one I am 100 percent sure. The driver asked me if I wanted to go to the relief centre in KT, and I agreed. It was in Sultan Sulaiman Primary School, Jalan Batas Baru. The driver handed me to the authority, giving his details of whereabout he found me. The other flood-refugees were from the peripherals of KT. The person in charge was from the Welfare Dept, and the centre was run by his department. It appeared that he was short of staff to manage the centre, so, knowing and seeing that I was rather 'educated', and a young teen-ager, innocent looking, and going to become a full-boarder, he asked me to help him, which I obviously agreed. Of all the 'job' that needed the staff, he put me in charge of the food storekeeper. It was a clerical work, filling the registry book of items that came to the store, a modified classroom, and that taken out of the store, no question asked, from whom? by whom?, or to whom, or even for what purpose. The cooking was done in communal by the ladies. Men were very few, probably they stayed at their sunken homes guarding and prepared for the worst. There was no problem at all, and I enjoyed in carrying out my duty sincerely. I stayed there for two days. On the third day when I heard that the road to Batu 6 was opened and there was a bus going there, I told the officer that I wanted to leave, thanking him very much for taking care of me. Before noon I reached home, still in flood, but subsiding. I told my mother of my 'journey', she apparently had not worried about me for the past few days, somehow she felt I was safe and dry somewhere even though the school was closed many days ago. The sky cleared as December advanced although monsoon would be with us until end of February, the earliest. December 25 was Christmas holiday, even in Terengganu, and the next day, Monday 26, as had been for many years, the SRP results were announced, available at the school. I rode a bicycle to the school, with my causin Ahmad Yusof, reaching the school late in the afternoon, the office was already closed. A fellow friend told me that the results was with CheGu Saadiah, my Form One form teacher, at her quarter in the school compound, and I went there. She was in, as was her husband CheGu Ahmad Yahya, my form teacher. When she told me the results, from the window while we were on the ground, in her words "Mat, all one", I became speechless, not knowing what to attribute to, whether I deserved it, or more plausible, my destiny. It did not occur to me at all to imagine how were my other friends reactions that morning when they saw their results, because I arrived late. That was actually the moment, one of the moments that I missed in my life for at my age that was one of the major milestones in our life, and SRP was my first important exam, after the Std Six Exam in 1963 which I also missed to reckon its significance in my life, and when I was about half century old I realised that actually it was the most significant event that marked my destiny.